Much of success in life is about getting everyone on the same page—whether it’s personal or professional relationships. And inevitably someone has to choose to lead the charge in getting clarity. As fighter pilots, we reviewed comm procedures during pre-flight briefing to ensure that everyone would be on the “same frequency”. In this case gaining clarity could mean the difference between life and death. In team sports like football and baseball we see players and coaches using all sorts of signals and methods to achieve communications clarity—waving a hand, brushing an arm, touching a nose. In these games it’s immediately obvious that clarity is the starting point for precise execution. Without clarity things fall apart right in front of our eyes as the play unfolds; the feedback loop is immediate and obvious—from both the players and the fans. Unfortunately it’s usually not so obvious at work and the loss of alignment and focus of energy takes longer to show up, but it eventually does. I see it every day and I understand why it’s so easy to fall into this trap. There are several issues at work here as well as the natural behavior and talents of individuals. We’re all uniquely designed and are naturally inclined to communicate in unique ways. The goal is to understand your natural behavior and make positive adjustments so that everyone clearly understands your message. We use the Leadership Behavior DNA assessment with our clients to confirm natural behavior and then build a team development strategy that guarantees better performance and results. Don’t assume that everyone hears (and visualizes) your message. We have a natural tendency to assume that if it’s clear to us, why would it not be clear to others? Going back to our sports analogy, teams usually have set plays and they rehearse them in practice for weeks in class and on the field—both verbally and visually and even physically—before they execute them in the game. Hours and hours are spent getting everyone executing their assignment for each situation. At work this is usually not the case. For most situations there is no playbook, so when the leader calls the play, team members create their own individual mental diagrams/pictures of what it’s supposed to look like. And of course some are distracted and never even hear the message. Further compounding the “fog” is the reality that individuals have different personalities and learning styles. Regularly and publicly clarify standards and expectations. At the top of the organization most of these expectations may be at the 100,000- foot level. As we move down the organization, the clarity gets more granular as standards are interpreted more specifically to the environment and tasks. There are several issues of human nature working against us here. First, it’s hard work because it takes mental discipline, time, and energy to clarify what is expected and what level of detail is required. Second, as the leader, if you set, clarify, and emphasize high standards, then you have to live up to them also – and what if you fail? I’ve actually seen many leaders resist clarifying expectations because it seemed easier and much less threatening to retain flexibility and interpret standards on the spot. That way they could avoid having to confront themselves with their shortcomings. Likewise, if expectations are loosely defined, leaders may feel they don’t have to be the enforcer. Confronting others about their behaviors is very difficult for most leaders and especially for those who fear looking like the bad guy and not being liked. The reality is that we respect leaders who hold themselves and others accountable to standards, and we don’t trust those who don’t. Accountability is the next step along the way and we’ll cover that in my next blog. How are you doing on clarifying standards and expectations? Reflect on it yourself and look for times when people were not on the same frequency with you. What happened? Whose responsibility was it? Get feedback from a couple of your stronger players on how well you are doing on clarity. 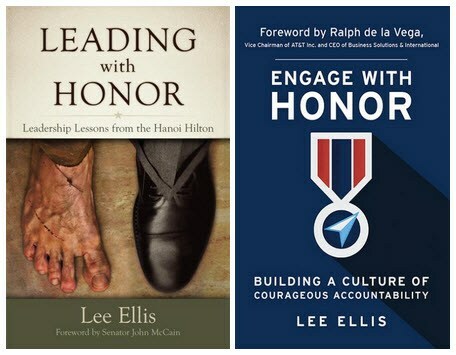 In Tongue and Quill, the Air Force handbook for writing and speaking there was one idea that stayed with me: to get better, you have to “fight for feedback.” Fight for clarity and then you will be more successful when you’re communicating with others. 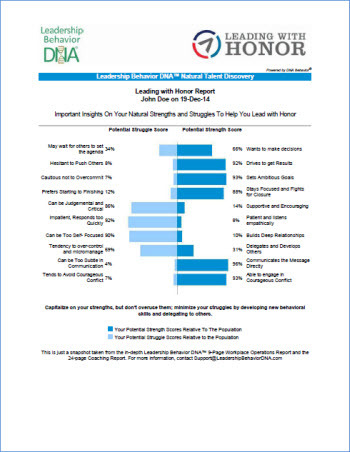 The unique, psycho-metrically validated Leadership Behavior DNA® (LBDNA) assessment process can pinpoint your exact leadership style including how you perceive boundaries in work and team dynamics. Thousands of people every year rely on LBDNA to help them and their teams grow both personally and professionally.